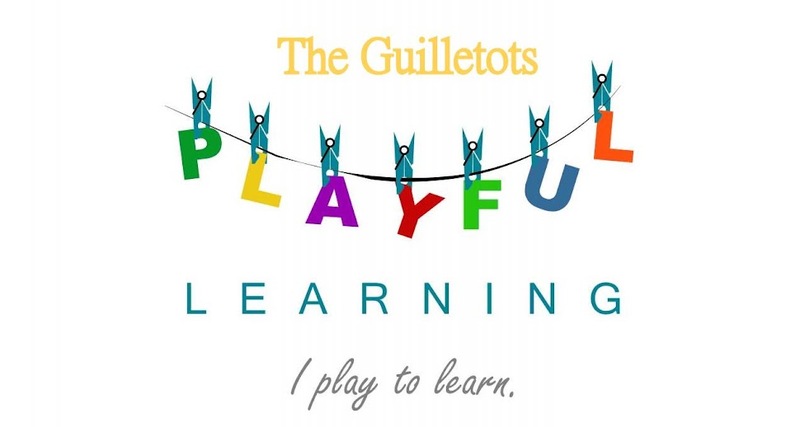 The Guilletos Playful Learning: Harvest time is here! 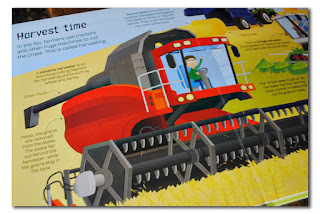 "I can see flowers growing in the pumpkin vines"
Child: "I can see a yellow round thing now. Is it a baby pumpkin?" We harvested them this week. We finally finished our booklet and put it together. Harvesting apples was just as easy as harvesting pumpkins. I brought the children to my other garden and I invited them to "harvest" the apples. They looked at me, very puzzled. I asked them "how do you think we can harvest the apples from the trees? What do we need to do?". Still unsure, nobody would move until a little girl moved forward and pulled one apple. " See? That's what you do!" Our next move was a threading exercise. The children coloured the template of an apple. I laminated them, cut the shape of the apple out and punched holes around the apple. I then showed the children how to use a red woollen lace around the apple. Lacing provide an excellent small motor exercise, helping children to control their movements and develop their hand-eye coordination. The children loved the back and forth action of the threading. I didn't ask them to thread in a specific way. I let them have fun and enjoy their creation. 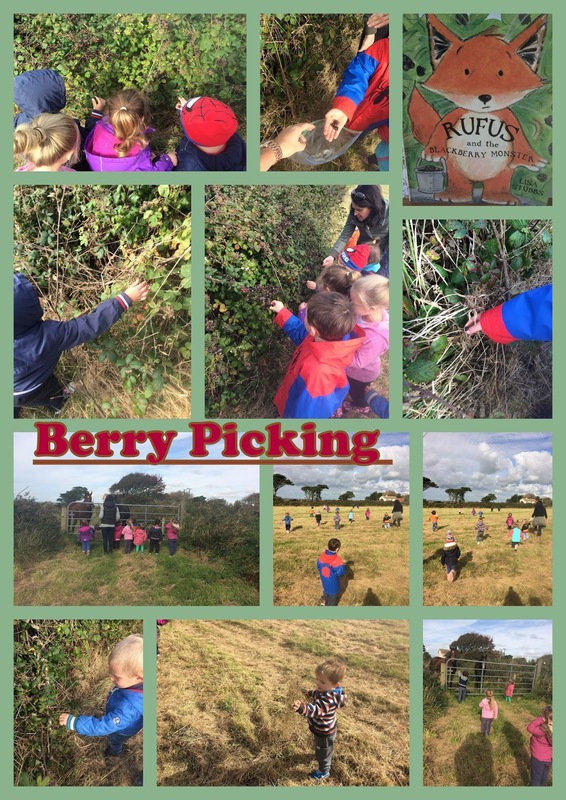 Finally, after the children showed an interest in baking, we decided to go and pick some black berries for our baking activity. 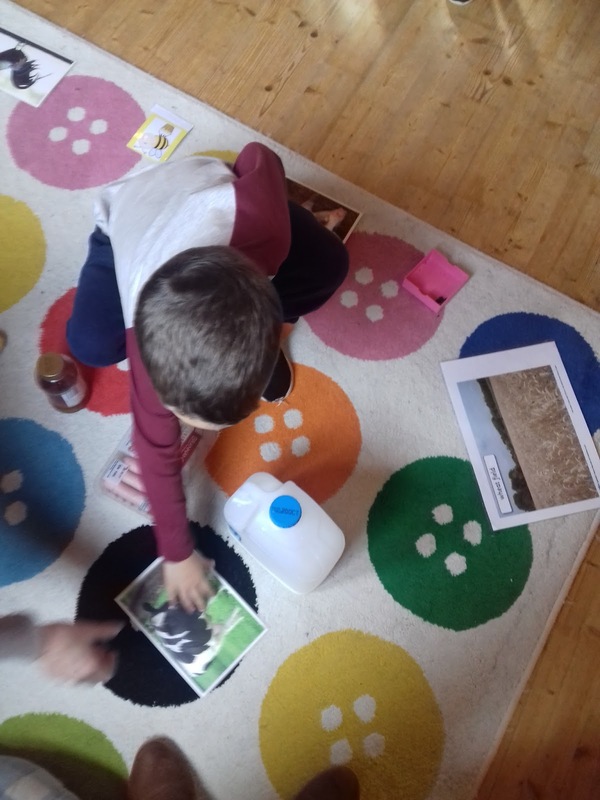 These types of activities teach the children about the world around them: the children engaged and experimented in their environment and saw how to use certain physical skills to manipulate objects and materials (how to cut a pumpkin, how to pick an apple from the tree, how to thread etc..). They are simple activities but are hands-on learning experiences. 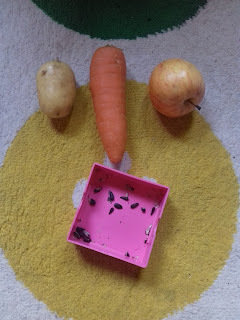 As part of our Harvest theme, it came to our attention that some children didn't realise where food came from. When asked where milk came from, they said Tesco or Aldi. 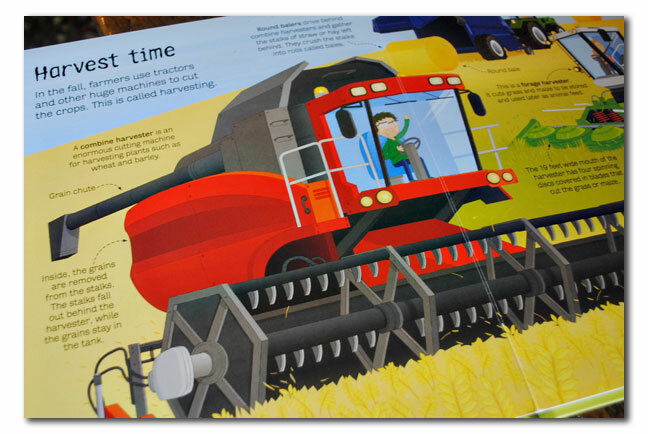 So we started by reading our book about harvesting. 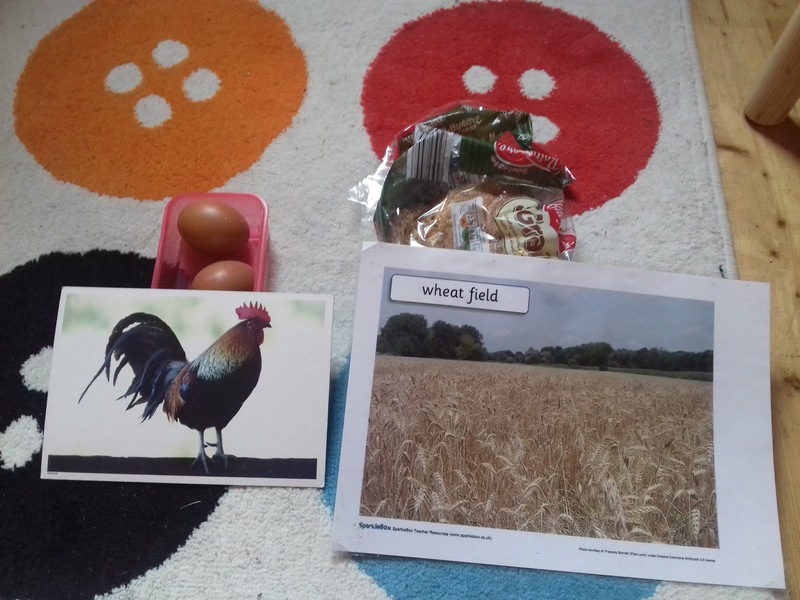 It has very little text but the photos are enough to show the children where the food comes from. 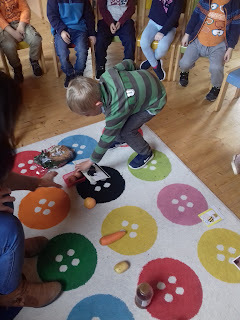 At circle time, as an extension, we played a little game: we presented the children with different types of food (carrot, potato, apple, honey, sausages, milk, eggs, and bread). We wanted to teach them that food comes from a lot of varied sources. 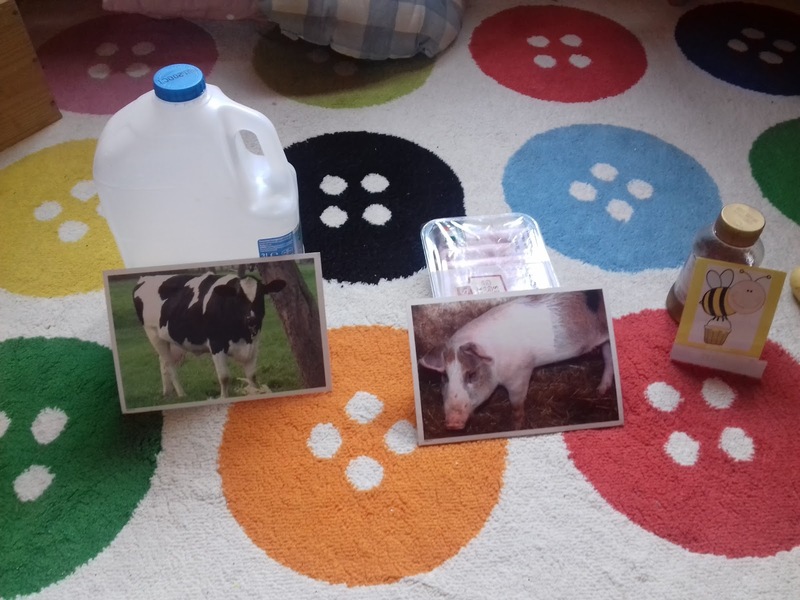 We then presented them with pictures of a cow, a pig, a bee, wheat ) and with a box of mixed seeds. 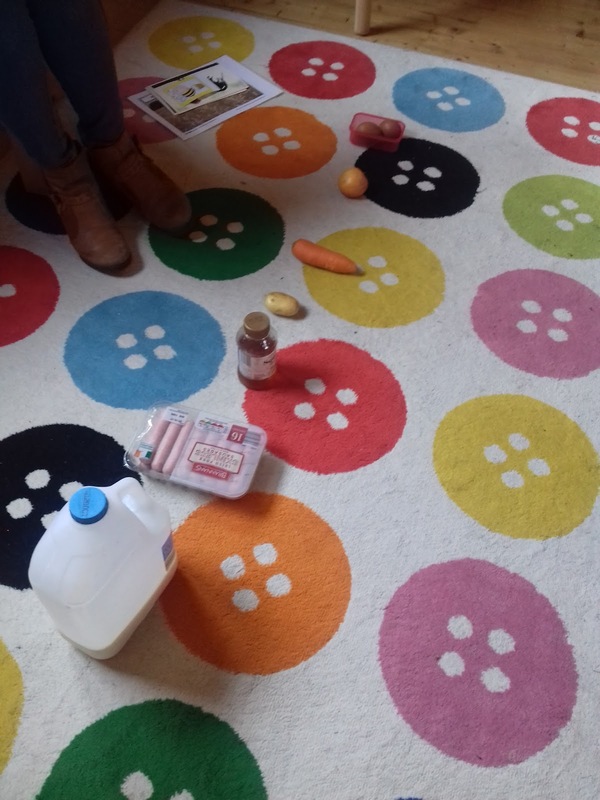 We then asked the children to come and match the food to the pictures.